This megaload shipment crossed from Idaho into Montana in 2009. The new proposed route comes months after a federal judge in Idaho blocked the company from traveling along U.S. Highway 12 and a protected wild and scenic river corridor in northern Idaho. The megaloads would leave Idaho and enter Montana along U.S. Highway 93. 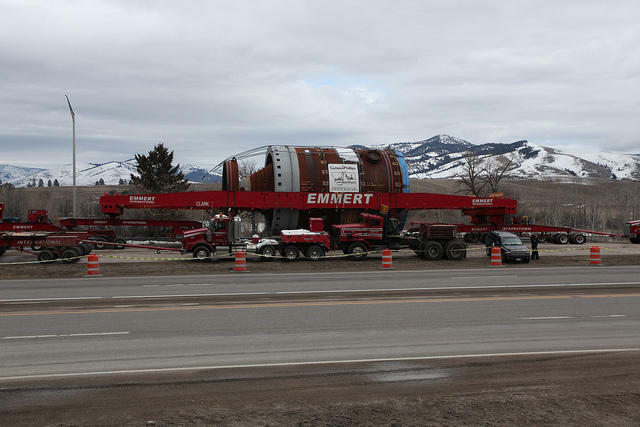 A federal judge has granted a request from the Nez Perce Tribe and an environmental group to temporarily stop shipments of giant oil-field equipment from moving across a winding Idaho highway. U.S. District Judge B. Lynn Winmill issued the ruling Friday morning, barring Omega-Morgan from shipping the so-called megaloads along Highway 12 until certain conditions are met.